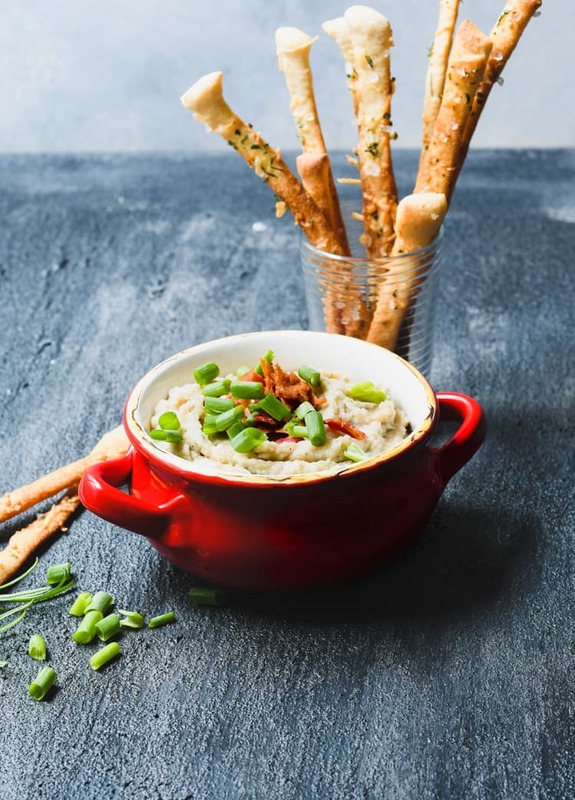 This tasty Rosemary White Bean Dip is paired with Parmesan Breadsticks for an easy, tasty fall party appetizer! With fall right around the corner, that means it’s time to start thinking about back-to-school events, pot lucks and of course football watching parties! 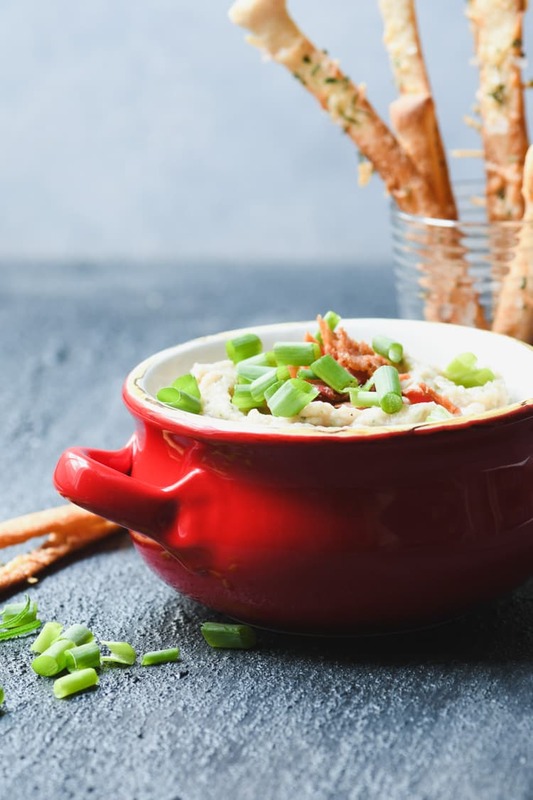 This dip is easy to make and is sure to be a crowd-pleaser. What’s not to love about something that’s loaded with flavor and topped with bacon?! Dips are always a great option when you need to bring something to a potluck or football party. They are easy to transport and always popular with party guests. Something interesting for dipping is definitely a big bonus! 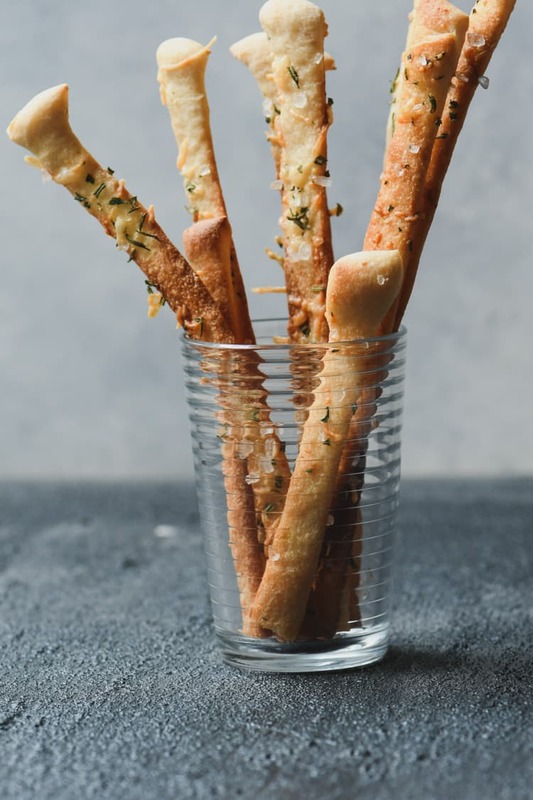 These rosemary Parmesan bread sticks are the perfect dipper for this tasty white bean dip. They hold up well and have a nice crunch to them too. The dip is super easy to make and with only a handful of ingredients, it comes together in a flash. Just a few pulses of your food processor and you are ready to go. And it’s naturally vegetarian too since it uses vegetable broth. This one disappears quickly, so if you are going to a large party you can always double the recipe. On a lightly floured surface roll the pizza dough out into a 16 x 12-inch rectangle. Cut in half to form two 8 x 12-inch rectangles. Using a pizza cutter, cut the dough into 1" wide strips. Each rectangle will make 12 breadsticks. Transfer breadsticks to the parchment lined baking sheets. Mix 4 tsp rosemary with the parmesan cheese. Sprinkle on the breadsticks. Bake for 10 minutes until golden brown. While the breadsticks are baking, make the dip by adding the beans and garlic to a food processor fitted with a standard blade. Pulse 5-6 times. Add the rosemary and green onion. Pulse again. Add the lemon juice and broth. Process for 30 - 45 seconds until dip begins to get somewhat smooth. Transfer dip to a serving bowl. If desired, top with bacon. Serve with breadsticks for dipping.